I've always been a fan of macro photography, both looking at other's macro photos and taking my own. Purchasing the Hoya close-up filters has opened up a whole new world for me, and my passion for macro photography has become overwhelming. This photograph means so much to me. It reveals the beautiful details in the 'small' world which we overlook. 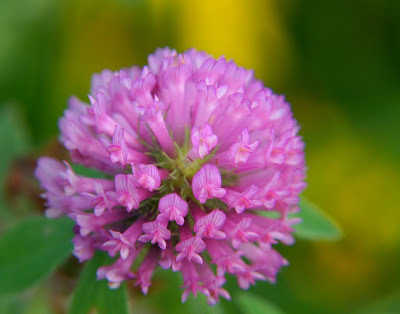 Honestly... did you ever notice that a simple clover flower is so intricate and beautiful? I confess that I certainly never did... until now. There are thousands and thousands of clovers back by my pond... I had absolutely no idea what I was missing, until I took this photograph. It really makes me want to take the time to take a closer look at everything else I've been overlooking or taking for granted. Macro is my favorite form of photography as well....love all the detail. Your photo is gorgeous! Gorgeous! I love macro photography too because it makes you realize what we have missed and it does open up a whole new world to us. I also have a great interest in the insect world because of it. Such a nice visit today, I've truly enjoyed catching up. I too, love this photo. I was blown away by the detail in the image. There is nothing quite like it, and this is absolutely beautiful Misty. So glad you are enjoying the filters!